The Art of the Back Splash – Gather favorite family photos and/or small, framed works of art to lean against your current back splash, creating a new look for this part of your kitchen. You just want to make sure your art and photos are covered with glass, so any mess will be easily wiped clean. 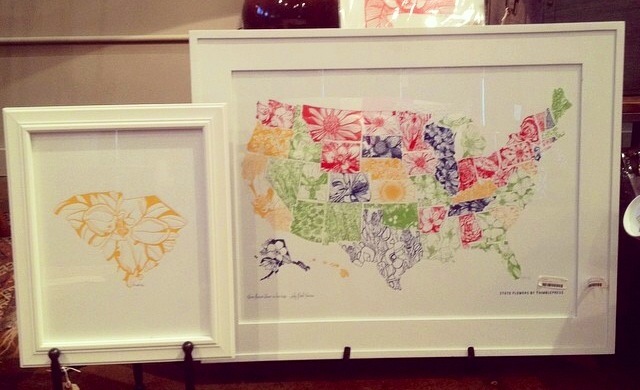 These prints from Thimblepress would add a perfect pop of color and a bit of a custom feel (pick any state you love!) to your re-freshened kitchen! Available at steve mckenzie’s. Repurpose a Pitcher – Pitchers can be used for so much more than serving a nice drink! Select your most-loved kitchen tools and bring them within easy reach by displaying them in a beautiful pitcher on your counter top. Raise the Comfort Level – Add a throw pillow to the seating option in your kitchen, not only will it add color and texture, it’ll provide lumbar support so your family and friends may never want to leave your ever-so-comfortable, newly freshened kitchen space! The color options available in these steve mckenzie’s pinstriped pillows ensure a look to compliment your space! New Scents Make Sense – If you’re always cooking up unique eats, chances are your kitchen is retaining some of those smells from last night’s fish dinner. A nice candle may be just the ticket to eliminate those odors and provide an especially welcoming environment each time they enter your kitchen space. A simple candle in a smart scent, such as this “Twisted Sage” version from steve mckenzie’s, will allow guests to you to enjoy the new feel of your space using your sense of smell. Ahhh… A kitchen you and your family will really be able to sink your teeth into! All it took was a few re-placed accessories and some creative solutions. Implement these ideas in your space and you’ll be enjoying a new kitchen in just 10 minutes!